Another entry in my peek at peaks series. These are (highly) contingent forecasts for the future of the macroeconomy and the planet. While there is plenty of statistical uncertainty to go around in such forecasts, the main contingency is which UN population forecast you believe in. Most of my figures are based on the "low" forecast for two reasons. One, that is the one we are closest to. Two, that is the one we should be on, or one even lower. Tonight's figure forecasts peak carbon dioxide flux (or flow) into the atmosphere from human-driven energy consumption. The forecasts assume continuation of current trends, no special fiddling. 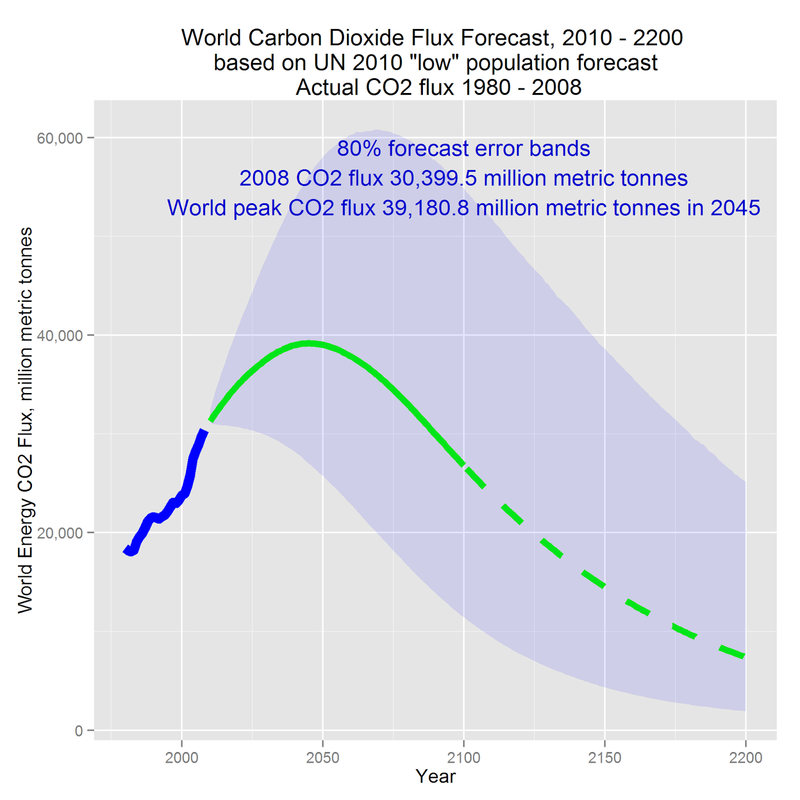 If you believe the low population forecast, the peak flux is in 2045, at a level (flow) about a third more than in 2008. So there is good news - there is a peak - and bad news - we may fry before we reach it. We need radical energy solutions to address that. I am working on it. Really. Here is the graph. Enjoy, question, comment.